I recently gave a talk, or more like a "therapy" session with Mullen's Chief Innovation Officer Edward Boches at the MIMA Summit in Minneapolis. A fantastic event populated by some of the most innovative companies in the world including Target, 3M and Best Buy. I have a bias when it comes to "innovation" that people tend to hyperfocus on what Google's Avinash Kaushik called "transformational" innovation. Ironically, a great example of transformational innovation would be Facebook which is transforming the Web from information to social interactions. But I focused my portion of the conversation on where I spend most of my time which is "incremental innovation" or smaller innovations which are not designed to dramatically transform, but can be effective ways of moving an organization in the right direction. Here are a few tips on how to innovate in spite of innovation. Innovation doesn't always occur as the result of a single big idea (lightbulb) but can often times be the result of many little ideas. If we think about ideas, concepts or thoughts as fireflies vs. a giant lightbulb, you realize that fireflies need to be "caught" and placed in a jar. When collected, lots of fireflies can generate just as much light as a light bulb, but the trick is pulling out the right firefly or idea at the right time. Many good ideas were ahead of their time. Coming from a design background, I stress the value of prototypes and define them broadly. Prototypes don't always need to be built out of code or material. 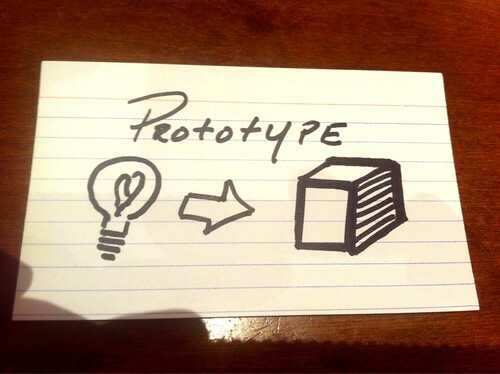 A prototype needs to go beyond spoken or written word. It can be a visual, or process design or even a concept video. But it should be tangible, and it should communicate the value of the innovation. Edward busted my chops a bit because I was using index cards to gather my thoughts vs. an iPad. I took that opportunity to stress that culture is more important than technology when it comes to innovation. I've seen companies with state of the art working spaces and those with just the basics in place and innovation happening at the latter. When it comes to pushing things even just a little, you don't need the latest and greatest tech but you do need a fire in the belly which is shared by your peers. Related to the last point I referenced specific examples where I had seen better ideas come out of hallway conversations vs. "brainstorming sessions" where the most "creative" people are invited to the table. When trying to innovate, as a manager the most effective thing you can do is find, harness, and conspire with those who are willing to take up the cause with you. Innovation is a cause. It makes people uncomfortable and challenges them to stretch their own abilities. During our session, several individuals expressed the frustration of not being able to get "innovation funded". There are creative ways around the obstacle. On the professional services side, one way is to make a business case to a client which funds the initiative for you and gives them first dibs on an idea. On the corporate side, it can entail working up a business case and showing how much can be made or saved. Or there can be business cases built around things like visibility, marketing, press etc. Speaking the language of business means speaking in terms of business outcomes and not just the brilliance of the potential innovation. Do this and you'll be one step closer to finding a sponsor. One of the things that I like about Kickstarter is that it meets a need that has previously been unmet. There are lots of people with projects in need of funding, and as it turns out there are also a great deal of people who feel good about supporting a project they believe in. The results is a marketplace where "buyer" and "seller" both benefit and exchange value. But prior to the platform, neither group likely knew that needed to work this way. These are a few personal "values" that I try my best to consider when I work and hopefully push things forward. What are yours?